Weird game mechanics here - and I mean it positively. I expected a turn-based gameplay, but then turned out it's the opposite - smashing the keyboard quick to escape the monster. Maze regeneration is also a unique feature. The presentation is a bit lacking at the moment, which is not a problem for a prototype, but in my opinion, this is an idea that can be build upon. Made it through on second try! Very interesting concept, also like the fact that music and background change when switching the maze. 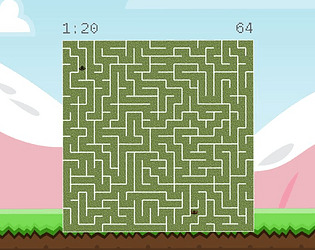 From the tech side, procedurally generating these mazes is definitely a nice touch!